Two suspected jihadists, including one who was making explosive belts, were killed by Saudi security forces on Jan. 7. 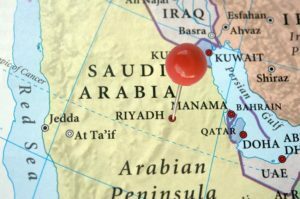 The suspects were shot and killed during a police operation in the north of the capital Riyadh, the Saudi Interior Ministry said, according to AFP. Tayeh al-Saihari and Talal al-Saidi, who were wanted by authorities for their alleged involvement in jihadist operations, were spotted in a house in a northern Riyadh neighborhood, a ministry spokesman said. Security forces surrounded the house at dawn and ordered the suspects to surrender but they refused and opened fire on the police who then launched an assault, killing them both, the spokesman said. The interior ministry said two explosive belts “ready to be activated” were found in the house, as well as a homemade bomb and material that could be used to make explosives. Saudi Arabia has in recent years foiled several terrorist attacks on its soil. In October, the kingdom arrested eight suspected terrorists who plotted killings and a car bombing. In September, Riyadh said it thwarted ISIL-linked terrorist operations that planned to target citizens, scholars, security forces, and vital facilities nationwide.